We have been getting a great response from schools joining in the Whanganui Gourd Project this season. Some grew gourds successfully last summer, others want to try again even though they had no luck with their plants, and still more classes are joining in for the first time. The enthusiasm of all of these children is awesome! My first set of seeds have germinated after more than two weeks of sitting near the fireplace inside. I’m putting them out into the sun each day to get some sunshine. If you have a hard frost, as we did here a couple of days ago, have a good look around your garden and find a spot that is protected from the frost. If there is room for vines to grow there, and it gets plenty of sun, consider setting that part of your garden aside for your gourds. 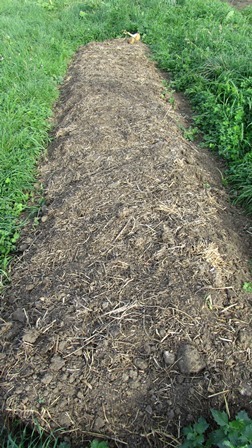 Get the ground ready now, by adding plenty of rotted compost to the ground. Cover it over to stop weed seedlings from growing, until it is time to transplant your gourds outside. In Whanganui it is not yet warm enough for gourds to go into the garden. It’s great to have so many school classes and gardeners keen to join in with the Whanganui Gourd Project over the coming Spring, Summer and Autumn of growing. Last Autumn the first frost didn’t hit until right at the end of May, so it was a long and warm growing season, just what is needed to get a good dried gourd with a strong, thick shell. 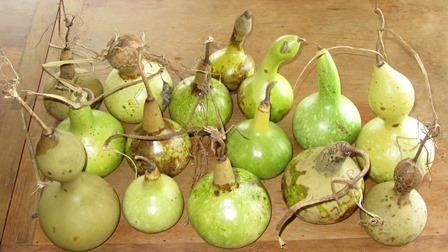 Many gourds will be dry already, with the seeds rattling around inside. Others may still be green-shelled, but be patient. Natural processes take time! 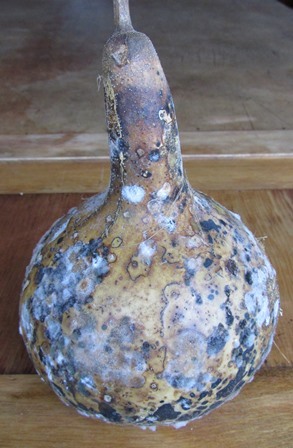 A few gourd growers have had trouble with mould. Don’t give up on your gourds if they start to go mouldy on the surface. Just wipe them clean with methylated spirits or bleach, and put them in a more well-ventilated place, where they can have air all around them. Whanganui is in the grip of a bitter cold snap right now, and it feels as if Springtime, which was well on its way a week or two ago, has paused, waiting for the Wintry blast to leave. The earth is still cold, and in places, soggy from so much rain. It’s not the best time for gourds to grow outside yet. Even though the weather is still cold, you can get your gourd seeds planted. Soak them overnight to soften the tough outer coating, and plant them, one seed per pot, in a nice warm sunny and sheltered spot. Hopefully in about a week, the shoots will appear. My first set of seeds have been slow to germinate; no sprouts yet. When the temperature gets to 20 degrees, I’m sure they will wake up from sleep and begin to grow. If you haven’t got hold of your seeds yet, come on down to the Whanganui Regional Museum in Watt Street, Whanganui and pick up a packet! You’ll get a handy illustrated pamphlet, with guidelines for seed-sowing, and useful information for gourd growing. 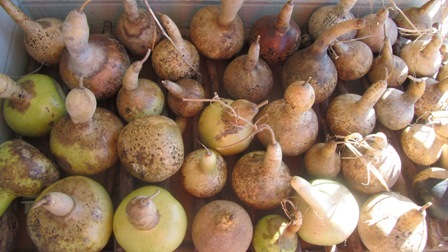 Gourds from the 2014 Autumn harvest are now well on their way to their dry state, with seeds rattling around inside. Larger gourds will take a little longer than smaller ones. 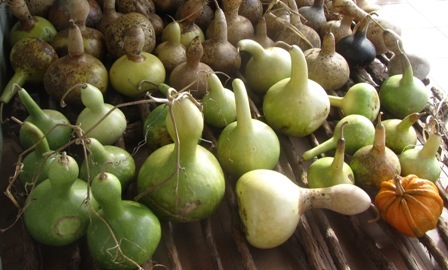 Some gourds dry perfectly, with an intact outer skin and no sign of mould. 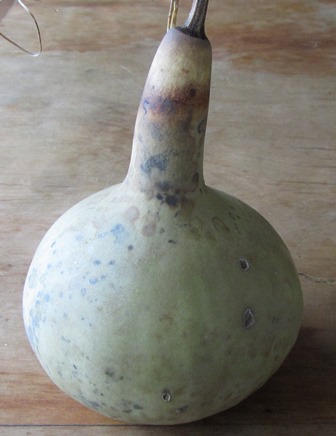 Others dry with an interesting pattern of mould, but no risk of rotting.If your gourd is wet underneath, make sure it is lifted, and has air circulating on all sides. If the outside surface begins to go mouldy, don’t give up and throw your gourd away. Just get an old cotton rag, dip it in methylated spirits (or white spirits) and wipe the mould off the surface. The alcohol will kill the mould spores. Keep checking the gourds and wiping them if you need to. the outer skin may go soggy and rub off, but the inner hard-shell of the gourd will remain intact, and you will end up with a beautiful dried gourd. Winter came late to Whanganui, with mild autumn weather until late in May, when the first frost arrived. This should have killed off all the remaining gourd plants, however some in sheltered spots, some continued to grow right through until early in June. Winter is a time of rest in the garden, giving the ground a chance to sit undisturbed. Old plants rot and become valuable rich organic matter for the next season’s growth. Now it is August and Winter is retreating. Days are lengthening, and despite the occasional frost or gust of bitter wind, temperatures are again becoming warm and mild around Whanganui. It’s time to get those gardens ready for a new season of gourd growing! It’s always a good idea to clear away any weeds before they flower and drop seeds, pile on some compost, and cover it with a thick layer of mulch to stop any new weeds coming up. It’s still too cold to plant gourd seeds outside; they need a temperature of around 20 degrees to germinate. Now is a good time to start the seeds inside, in a sunny spot, like a window-sill, or a sunny sheltered deck or patio. You can refer back to last year’s blog for step-by-step instructions for seed sowing. So come in to Whanganui Regional Museum in Watt Street, Whanganui; pick up a packet of gourd seeds, and get growing!